Bob Gibson is the quintessential fan-favorite pitcher for the St. Louis Cardinals, having spent his entire 17-year career with the team. His popularity as a player translated into many in-demand trading cards and this top list features Gibson's best cards across his entire career. 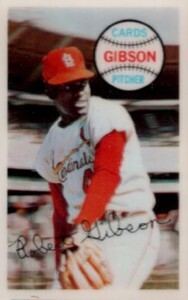 Shop for Professionally Graded Bob Gibson Cards on eBay. While many hurlers are famous for beginning their career at a young age, Gibson actually attended college under a basketball scholarship and didn't debut with the Cardinals until he was 23. Despite the relatively slow start, he developed into the hardest throwing, right-handed pitcher in the National League and finished his career with 251 wins and over 3,000 strikeouts. These accolades alone put him in an elite category, but it was Bob Gibson's performance in the 1968 season that made him a true pitching legend. Although he went 22-9 with a league-leading 13 shutouts and 268 strikeouts, it was his 1.12 ERA over 300 innings pitched that was so remarkable and he would end the season with both the National League Cy Young Award and Most Valuable Player Award because of it. Along with repeating as Cy Young winner in the 1970 season, Gibson was also a notoriously great defensive pitcher and won the Gold Glove award nine consecutive seasons between 1965 and 1973. He would retire after the 1975 season and became a first-ballot Hall of Fame member in 1981. A few notable cards from Gibson's playing days that didn't quite make the list include the over-sized portrait cards from 1964 Topps Giants, 1970 and 1971 Topps Super, and his final card as a player from 1975 Topps. Each of these would also be a great pick-up for collectors on a limited budget. 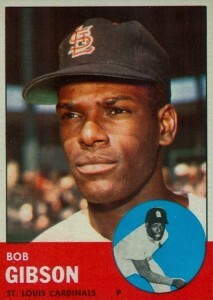 In addition to the cards from his career, Bob Gibson was included in some of the earliest on-card autographs sets. He was a part of the Nabisco All-Star Legends set from 1994, however, the cards were not officially licensed by MLB and all logos were removed from the cards. Another key early autograph set was 1997 Donruss Significant Signatures set which features 2,000 Gibson autographs that had been signed on the wrong side of the card. Rather than signing in the open space next to his photograph on the front of the card, Gibson signed the back under the serial numbering. Despite this, Donruss released the card and it created an interesting footnote in baseball card history. 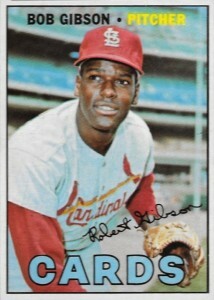 As Bob Gibson was one of the best pitchers from the 1960s and also played for one of the most successful and popular franchises in the league, his cards remained consistently popular. In formulating this top list, card value is a major determining factor along with design and overall demand. Click on the images or listings to shop for cards on eBay. When available, linked sets/players in the descriptions go directly to detailed profiles. 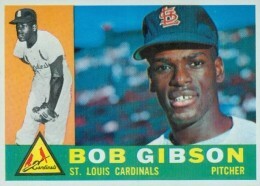 Gibson's card from the 1970 Kellogg's 3-D Super Stars card comes in two variations. One is an error-free version of Gibson's card and the other is missing his innings pitched total during the 1959 season. The 1970 set was Kellogg's first cereal baseball cards and it has become very difficult to find high-graded versions because of issues with the printing process. 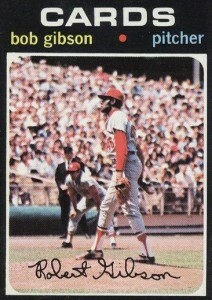 1971 Topps saw the first widespread use of in-game action photos and the Bob Gibson card is one of the best in the entire set. With the stands full of fans looking on, Gibson is getting the sign from the catcher and about ready to start his windup. The reverse side of Gibson's 1967 Topps card highlights his amazing fastball that was frequently referenced as the fastest in the game. That fastball was also responsible for his ability to record strikeouts and he still holds the record for most strikeouts in a single World Series with 35 during the 1968 series versus the Detroit Tigers. Bowman's 1955 set is famous for the TV design but Topps came close to using their own television-inspired design on the 1968 Topps cards that covered the previous season's World Series. 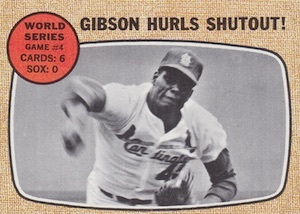 Gibson's card highlights his shutout from Game 4 and the Cardinals eventually won the series in seven games. Gibson's success in the World Series throughout his career is also featured in the 1965 and 1969 Topps sets. Taking a look at the back of Gibson's 1963 Topps card, you would be hard pressed to think that he was going to be a future Hall of Fame pitcher. The 1963 set has one large cartoon included on the reverse side of each card and Bob's shows his catcher diving to try to catch one of his pitches as Gibson led the league in walks. Up to that point, he had a major league record of 34-36 but he would be 217-138 over the rest of his career. 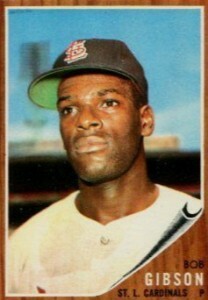 The Bob Gibson card in 1962 Topps is a short-printed, high-number and it is one of the most difficult and valuable cards to find in the final series. Eagle-eyed collectors should also look for cards #110-#196 of the 1962 set to see if they have the famous green tint that was common in the second series. 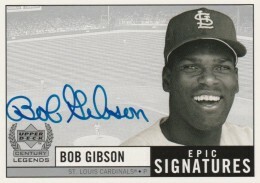 Gibson has been a frequent signer in modern baseball card sets and his autograph is one of the most recognizable from his era. His signature is very clean and you can always see each letter clearly. His autograph is also famous for the loops in the "B" of his first name and the "i" in his last name never being dotted. The Epic Signature autograph in the 1999 Upper Deck Century Legends set is a beautiful example of a quality Gibson signature. A great starting spot for Bob Gibson player collections, 1961 Topps marks the point for Gibson where card value typically falls significantly as it is his third major set. Because Gibson's career started slowly, making his first All-Star team at 26 and notching his first 20-game winning season at 29, his most valuable cards are actually from the period of his career when he wasn't a great pitcher yet. Gibson's 1960 Topps card reminds us that he was a multi-sport athlete and attended Creighton University on a basketball scholarship. 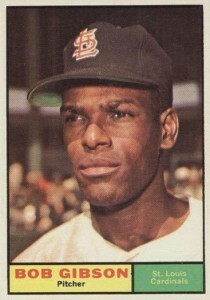 He even delayed beginning his baseball career with the Cardinals to spend a year playing for the Harlem Globetrotters. Ferguson Jenkins is another Hall of Fame pitcher that also spent time on the Globetrotter's roster. The 1950s have so many remarkable cards and the 1959 Topps Bob Gibson rookie puts a nice topper on a key decade for collectors. 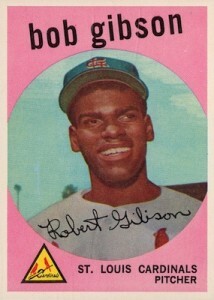 Gibson's hot pink card with his broad smile is the top rookie and the most valuable card in the entire 1959 Topps set. Near-mint copies regularly top $2,000 at auction with rare mint copies going for many times that price. 1995 Topps Legends of the Sixties 60's Bronze Medallion HOF RARE!